Evolution Gaming is the undisputed class leader when it comes to live casinos. The Latvian-based company opened its doors in 2006 with a goal of bringing actual live dealers into an online environment. Back in 2006, actual live casino streaming seemed like a distant pipe dream but companies like Evolution Gaming have turned it into reality with an exceptional instant-play software package that takes only seconds to load up. It might not seem like a lot but having an actual charismatic, human dealer can make a huge difference when it comes to the gaming experience! The gaming public seems to agree as Evolution Gaming has been busy opening massive live dealer streaming locations in Malta, Spain, Italy, Romania and Canada while racking up gaming awards. Over the years, Evolution Gaming’s software has gotten so good that it’s used by countless online casinos around the world who would rather contract out for their live casino needs. In fact, Evolution Gaming’s online casinos are so good that land-based casinos have also begun using them in certain locations! Evolution Gaming uses an instant-play browser option for all its desktop options. That means players on Windows or OSX will be able to take part in the lightning fast Evolution Gaming live casino. With live casinos, the speed of the internet is generally more important than the actual power of the computer you’re running the games on. Either way, Evolution Gaming tends to work well across most devices and requires less resources than you might think. Most games load very quickly and players are shocked by how easy it is to get into an actual live game. Evolution Gaming also has very good support for Apple or Android mobile devices with a browser option or a stand alone app. The company has gone a great job of making no compromises when it comes to mobile gaming and every table they introduce to the desktop edition of the software is also added to mobile. As mobile gaming becomes more popular, it’s just going to be all that more important for Evolution to continue to optimize everything for gaming on-the-go. Evolution Gaming is focused exclusively on live casino streaming so you aren’t going to find any slots or bingo. Instead Evolution Gaming offers a wide assortment of live table games. Fortunately, most online casinos use another developer for their slots so there’s a good chance you’ll still have a chance to spin a few bets if you get bored of table games for awhile. One thing that you can count on at Evolution gaming is proper RNG (random number generator) because everything is done exactly like a traditional Brick & Mortar casino with physical cards and roulette tables. Evolution Gaming doesn’t offer slots. Evolution Gaming doesn’t offer any non-Live Casino table games. Evolution Gaming offers offers arguably the best live casino in the world and its an impressive sight to behold with tons of games and basically lag-free gaming. The company obviously offers the big three — Blackjack, Roulette and Baccarat — but also offers tonnes of unique variants of each one. Depending on the casino you’re playing on, you’ll be able to play Blackjack with a variety of side bets or the French or European versions of Roulette. Evolution Gaming also offers the world-first Immersive Roulette, which features a Hollywood-style set-up with multiple cameras and slowmotion tech. Immersive Roulette means that with every spin of the wheel players will get a close up of the ball and slo motion re-play to help build the drama. The technology behind Immersive Roulette was so impressive that it won EGR’s game of the year in 2014. On the other side of things is Speed Roulette, which takes just 25 seconds from spin to spin. Betting only occurs during the spin so there’s no dead times. Players can get in approximately 50% more spins with Speed Roulette. Evolution also offers localized Roulette so Swedish, Italian and Dutch players will all feel at home. Outside of the big three, Evolution also has games like Casino Hold’em, Caribbean Stud and Three Card Poker. 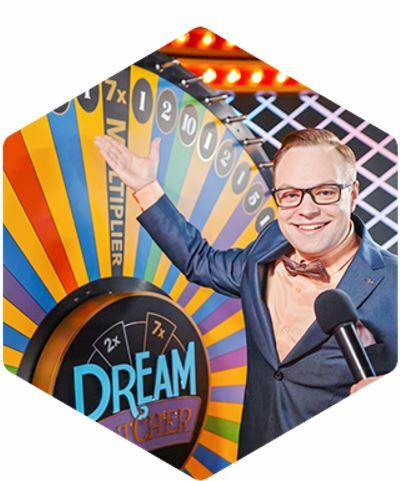 Evolution even has Dreamcatcher, which mimics the big money wheel that you often have on TV game shows. Finally, Evolution also has a VIP Red Room where players can take part in high-limit action. Evolution Gaming sticks to casino but has been developing some interesting products for TV that feature live casino gaming. Evolution Gaming is a relatively new entry in the online casino world but were one of the first companies to see the potential in live casino. The company was founded in 2006 in Latvia. Evolution quickly signed deals with several key operators to expand their live casino vision. As a result, customers immediately responded to Evolution Gaming’s new take on online casinos in a huge way and by 2009 the company was forced to quadruple the size of it’s original Riga-based live streaming studio. By 2010 the awards were starting to accrue for Evolution Gaming and it won the coveted EGR Rising Star of the Year. Evolution’s Riga studio grew so quickly that by 2013 it was the single biggest casino operation in Europe, which paved the way for the Malta live streaming studio that opened in 2014. The expansion continued from there and Evolution now has streaming studios that are build or set to open soon in Latvia, Malta, Canada, Georgia and the UK with over 3,000 employees. Evolution Gaming is listed on the Stockholm Exchange and has won EGR Live Casino Supplier of the Year multiple times in a row! Evolution Gaming is the go-to developer for live casino games. If you love to play Blackjack or Roulette with a live dealer or croupier, then you’re going to want to make sure the casino you’re playing supports Evolution Gaming. For anyone that hasn’t played a live casino game before you’d be surprised just how compelling an experience it can be when you have a friendly dealer and streaming software that keeps the action running smoothly. Evolution Gaming was the company that proved live casino gaming was not only possible but a fantastic way to play.